Leaves 7-18 × 1-2.6 cm; blade bright green, linear to lanceolate. Scape 5-10 dm. Flowers: perianth usually yellow to golden yellow, rarely white, cylindrical, 9-12 mm, more than 2.5 times as long as broad, lobes spreading. Fruits: beaks gradually narrowed distally. 2n = 26. Flowering spring. Seasonally wet to flooded pine flatwoods, savannas, bogs; 0 m; Ala., Fla., Ga., La., Miss. A white-flowered form of Aletris lutea was described as forma albiflora E. T. Browne. 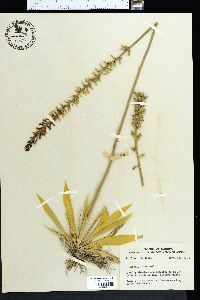 Hybrids of A. lutea × obovata occur commonly in intermixed populations and have pale yellow corollas of intermediate shape (V. I. Sullivan 1973). These hybrids have been named as A. ×tottenii E. T. Browne.